Team Jackson were selected as one of Scottish and British Curling’s ‘Performance Foundation’ teams for 2015-16, competing on a junior level and looking to gain experience to carry into tournaments higher up the chain in the future. 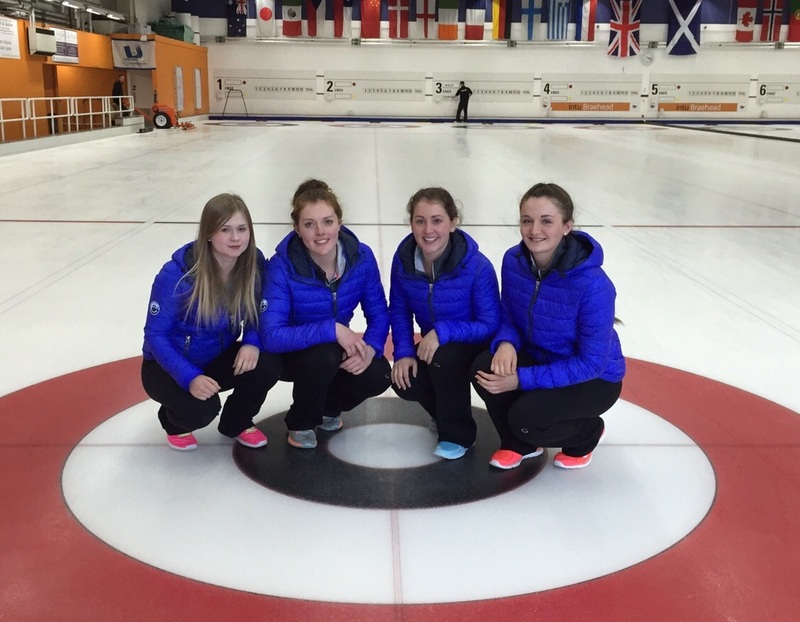 Here their skip, Sophie Jackson, introduces the team, reflects on representing Scotland at the World Mixed Championship in Switzerland and talks about their goals ahead. Q: Could you introduce the members of the team? A: Our lead, Rachel Hannen, has been curling for 13 years and has a long family history within curling. Rachel is very outgoing and the joker of the team which really helps to keep the team laughing in tough times (especially when we are all very tired!). It also helped with the initial team bonding as we were all getting along and having a good time instantly. Our second, Rachael Halliday, has also grown up with curling; she has been curling for 12 years. Rachael is very caring and a huge team player, helping to keep everyone’s head up in good times and bad. Naomi Brown, our third, is the same as the other girls with big curling names in the family and has been curling for 10 years. Naomi is the youngest on the team but she is such a great support for me, especially with it being the first season of my skipping career. She is always chirpy and happy. I, unlike the other girls, have no family history of curling – I got into it through primary school. I have now been curling for eight years. Q: The team have had positive results already this season, winning the Braehead Junior International – are you happy with how it’s gone? A: We are very happy with our positive start to the season, showing promise for later on. However, this is only the start and provides us with building blocks for the real showdown later in the season. So we are trying not to get to hung up on results and instead focus on continuing to develop as a team. Q: You represented Scotland at the World Mixed Championship – how would you sum up that experience? A: My experience at the World Mixed was an unmissable one. It provided many challenges, especially with the difference of a mixed team. The dynamics of the team are completely different from an all-female team. I learned lots of lessons from the experience, with it being my first world championships, which will stand me in good stead for the future. I also enjoyed playing lead for a change, the position I originally played, so it was nice to experience playing that position at a high level. Overall we had a great week, with seven wins out of nine, so we can’t really complain. Q: What are the team’s ambitions for the 2015-16 season from this point? A: We hope to keep up our good form in our competitions to come; but they are all stepping stones to the Scottish Junior Championships which is our main focus. And then hopefully following that, a good World Juniors. We are all willing to put in the work, which is a big part of having a strong team dynamic, as we all want the Scottish title as much as each each other. Q: What do you make of the strength of Scottish women’s curling at the moment, especially the development teams? A: Scottish women’s curling, in my opinion, is currently weak in terms of the number of teams competing; however, the teams competing are very strong performance level-wise which is promising. Hopefully we will continue to see junior teams come through and play the Ladies Championships and give the top development teams a run for their money. Norway won the inaugural World Mixed Curling Championship in Bern, Switzerland, as Scotland suffered an agonizing post-group stage qualifying round exit. The competition replaced the European Mixed Curling Championship, with 36 World Curling Federation member countries from four continents entering one team of two male and two female players. It was a young Scottish team which had qualified for the event, with skip Cameron Bryce joined by Katie Murray, Bobby Lammie and Sophie Jackson, and coached by Barbara McFarlane. Scotland were placed in Pool D, alongside Austria, Belarus, Brazil, Estonia, Hungary, Japan, Turkey and the USA. They had to wait until session four for their first match, but started with a bang, scoring four in end two and five in end six in a 13-2 victory over Brazil. The Scots then racked up wins over Estonia (12-4), Japan (4-2), Belarus (12-1) and Turkey (9-2), before a crunch meeting with fellow unbeaten side Hungary. The Hungarians were simply blown away, though, as Scotland scored four in end two and the stole three in ends three and four on their way to an 11-3 victory. Their own unbeaten record was lost in the next match, however – the USA proved too strong as they came through 9-3. They bounced back by beating Austria 6-3 in their final pool match, but the USA still finished top of Group D and therefore Scotland needed to win a play-off match to make the quarter finals. As for the other teams from the British Isles competing in Switzerland, England finished on a P1 L7 record, Wales W3 L5 and Ireland W4 L4. Scotland faced the hosts Switzerland in their quarter-final qualifier. A very tight match, it was 2-2 after four ends but Scotland led 4-3 after six. The Swiss scored two in end seven, meaning Scotland were 5-4 down but had hammer in the eighth. They played that end well and it looked set up for skip Bryce to claim two and the victory, but his final stone was a little wide, giving Switzerland a steal of one – and the win, 6-4. You can watch that match here. In the quarter finals, China beat Germany 8-3, Norway defeated the USA 7-5, Russia won 8-3 over Canada and Sweden squeezed to a 5-4 win over Switzerland. The semi finals saw Norway (7-3 against China) and Sweden (6-5 over Russia) progress, setting up a repeat of the 2014 European Mixed Curling Championship final, won by Sweden. This time Norway triumphed, winning 5-3. That meant Sweden had to settle for silver, while China won a 5-4 extra-end clash with Russia for bronze.